Masculine, diurnal, cold and dry, melancholic, earthly, malevolent, the Greater Infortune, Author of solitariness. Husbandmen, clowns,  beggars, day-labourers, old-men, fathers, grand-fathers, monks, Jesuits, Sectarists, Curriers, night-farmers,  miners under ground, tinners, potters, broom-men, plumbers, brick-makers, malsters, chimney-sweepers, sextons of churches, bearers of dead corpses, scavengers, hostlers, colliers, carters, gardeners, ditchers, chandlers, dyers of black cloth, an herdsman, shepherd or cow-keeper. All impediments in the right ear, teeth, all quartan  agues proceeding of cold, dry and melancholy distempers; leprocies, rheums,  consumptions, black jaundice, palsies, tremblings, vain fears, fantasies, dropsy, the hand and foot-gout, apoplexies, dog-hunger, too much flux of the haemorrhoids, ruptures if in Scorpio or Leo, in any ill aspect with Venus. Rules the spleen. Sour, bitter, sharp savours. Dark, sad, ashy colours, black. Bearsfoot, starwort,  wolf-bane, hemlock,  fern, white and black hellebore, henbane, ceterach or finger-fern, clotbur or burdock, parsnip,  dragon, pulse, vervain,  mandrake,  poppy, moss,  nightshade,  bythwind, angelica,  sage,  box,  tutsan,  orache or golden herb,  spinach,  shepherd's purse,  cumin,  horsetail,  fumitory. Trees and plants include Tamarisk,  savine,  senna,  capers,  rue or herbgrace,  polypody,  willow or sallow tree,  yew-tree,  cypress tree, hemp,  pine-tree. Deserts, woods, obscure valleys, caves, dens, holes, mountains, or where men have been buried, church-yards, ruinous buildings, coal-mines, sinks, dirty or stinking muddy places, wells and houses of offices. Lead, the lead-stone, the dross of all metals, also the dust and rubbidge of every thing. Stones -Sapphire, lapis lazuli, all black, ugly country stones not polishable, and of a sad ashy or black colour. Generally the body is cold and dry, of a middle stature; the complexion pale, swartish  or muddy, his eyes small and dark, looking downward; a broad forehead, black or sad hair, and it hard or rugged; great ears, hanging; lowering eye-brows, thick lips and nose, a rare or thin beard, a lumpish, unpleasant countenance, either holding his head forward or stooping; his shoulders broad and large, and many times crooked; his belly somewhat short and lank; his thighs spare, lean and not long; his knees and feet indecent, many times shovelling or hitting one against another. You must observe, if Saturn is oriental of the Sun, the stature is more short, but decent and well composed; if occidental, the man is more black and lean, and fewer hairs; if Saturn lacks latitude, the body is leaner; if he have great latitude, the body is more fat or fleshy; if the latitude be meridional or south, more fleshy, but quick in motion. If the latitude be north, hairy and much flesh. Saturn in his first station, a little fat. In his second station, fat, ill favoured bodies, and weak; and this applies to all the other planets. Profound in imagination, severe in his acts, in words reserved, in speaking and giving very spare, in labour patient, in arguing or disputing grave, in obtaining the goods of this life studious and solicitous, in all manner of actions austere. Then he is envious, covetous, jealous and mistrustful, timorous, sordid, outwardly dissembling, sluggish, suspicious, stubborn, a condemner of women, a close liar, malicious, murmuring, never contented, ever repining. 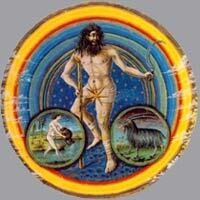 1] From the Greek, Kronos, 'time', from which a number of Saturn words such as chronic or chronology are derived. 2] Phainon: 'Shining one', one of a set of Greek names for the planets coined as alternatives to the practice of naming them after gods. These were never in general use. 3] Falcifer: 'Scythe-bearer', a Latin epithet of Saturn. 6] Member of a particular sect. 7] From the old English use of 'curry' — to finish and dress leather after it has been tanned. 9] In old English, a stableman, especially one at an inn. 11] A person who makes or sells candles. 12] (Of a fever), occurring every 3 or 4 days. 13] Malarial type fever with successive stages of fevers and chills. 14] Rheums: watery discharge from the eyes or nose. 16] Characterised by the accumulation of watery fluid in the tissues. 17] A stroke or sudden loss of consciousness caused by the restriction of a blood vessel in the brain. 23] These are already listed as bearsfoot - see note 18. Lilly probably mentions them again under a more formal title. 29] I suspect this was a common name for a plant such as Green Hellibore, which was known for its effect upon lowering the pulse. The Hellebores are listed under Saturn, and the plant is highly toxic, as many Saturn herbs are. 39] Hypericum androsaemum: It is closely related to St. John's Wort. Modern herbals give it no medicinal value, but traditionally it was valued for healing wounds. Its leaves were picked in summer and kept as 'book leaves' for their long-lasting scent. 57] This is the planetary day that starts at sunrise, not midnight. 58] Swartish: a derivation of swarthy — dark-complexioned. 60] Dissembling: outwardly concealing (one's real emotions, etc.) by pretence.